In the battle among the tech titans, Apple Inc. won the title in the last year for press appeal. The 34- year-old company attracted more coverage from the mainstream press than any other technology company – and the bulk of it was positive. Its popular devices and orchestrated PR strategy helped it even outpace Google Inc.
From June 2009 through June 2010, 15% percent of the technology stories focused primarily on Apple, versus 11% about Google. The two social media platforms, Twitter and Facebook, came next (7% and 5%). Twitter’s coverage during this time period largely centered around its communication role during the Iranian protests in the summer of 2009. Attention to Facebook was largely focused on the service itself and its interaction with its users. But the media paid little attention to any other technology players. No other company, including technology giants such as Amazon, Best Buy or Yahoo, registered more than 1%. And in covering these companies, the mainstream press focused heavily on the positive. And what about problems like ineffective touch screen, poor connections or limited user freedoms? Hard to find in this media coverage—just 17% suggested the products are overhyped, and less than half that, 7%, portrayed the company as too controlling with its products. But even more stories, 25%, emphasized Google’s help in navigating the Web by making content more searchable and easier to find. However, the third most prominent thread about Google was a negative one. The theme that gave Google the most trouble is one that often accompanies a fast-growing, dominant company within any industry. The idea that the company has too much information and too much power appeared in 19% of the stories about Google (the third most-mentioned thread overall). This idea appeared in a story on Fox News Live about a scandal where Google streetview cars were accidentally collecting personal information. Google was largely off the hook in the media’s eyes, however, when it came to accusations that the company steals others’ content, including the news media’s. This theme emerged in just 2% of the stories. For the two most written about social media networks, Twitter and Facebook, fewer distinct themes have emerged at this point. The two competing ideas surrounding Twitter are that the network helps disseminate information and connect people and that communication there is often pointless and self-centered. In this coverage, especially centered on Twitter’s role in Iran, the positive influence heavily dominated. More than two-thirds of stories (68%) highlighted its role as a disseminator of information, while just 4% focused on the pointless nature of posts. Facebook received largely positive press as well, though it suffered some from controversies surrounding its privacy settings. Most stories, 36%, articulated the value of Facebook in fostering communication; another 17% extolled its related role in bringing people together. But more than a quarter, like this AOL story from May 26, 2010, discussed users’ dissatisfaction with Facebook’s privacy changes and Facebook’s attempt to alleviate those concerns. 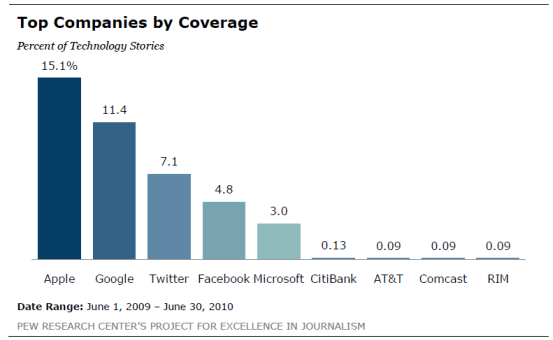 For more information Google, see PEJ’s “Who Owns the News Media” database of the top media companies in the U.S.